. @heraldscotland can't believe you are again promoting this poorly researched article. Dreadful representation of Scottish beer. Surfacing from the depths of the CAMRA stuff I am currently embroiled in - editing (writing?) a magazine, proofing Good Beer Guide entries, writing articles for local newspapers and the like - I had a look at Twitter and a message about a newspaper dissing Scottish beer caught my eye. Now as an exiled Scot, I keep my eye on the Scottish brewing scene as much as I can, mainly through the likes of @robsterowski and of course, through Scotland on Sunday, the paper edition of which I buy every week. It also allows me to look on in amazement at the word battle over Scottish independence, but that's another story. So what was this? A fellow exiled Scot has tweeted as above. The newspaper was the Glasgow based Sunday Herald and seemed to be to be absolutely inoffensive and in fact, given some of the absurd clichéd, tartan bedecked Brigadoonish names unwisely chosen by some, it has let them off more than a touch lightly. How about a pint of Sheepshagger? Or maybe some MòR Tea, Vicar? (There are no vicars to speak of in Scotland.) Or would your boat be more floated by Sporran Lifter, Kilt lifter, Nessie's Monster Mash, Santa's Swallie or the Terror of Tobermory? Funnily enough, I am very impressed by Scotland on Sunday's coverage of Scottish brewing and its rival now seems to be setting off down the same path. In fact there are plenty breweries mentioned that I didn't know of, so the article itself, far from being an insult, was serious attempt to look at what's going on and to me at least, informative. For the uninitiated, probably more so. 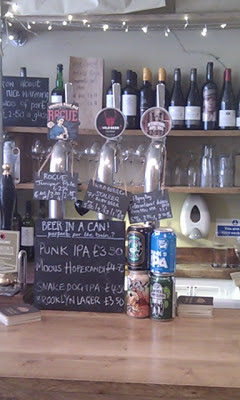 (Some of the beers in fact did have some well thought out and interesting names that had local connections without being naff.) The article actually illustrated that the newspaper was hosting a (slightly pricey) craft beer lunch where, one course lunch sampling of ten Scottish beers was offered. Something to be welcomed, in principle at least, I'd have thought. It is hardly the Herald's fault that some of the names are daft. This isn't a pop at my fellow twitterer. His take is different, this is just mine. The article can be read here. I've been busy on various beery things recently, but during this I stumbled across a very interesting document snappily called The Contribution of Beer to the European Economy. It gives a very detailed report of brewing activity in 31 different European countries. Ever wanted to know what's what in the Turkish, Slovenian or Luxembourg brewing industry? Of course you have. Who hasn't? Well it is all here in this lovely document. All 289 pages of it. There is lots of interesting stuff like 2 million jobs attributed to the sale and production of beer, loads and loads of tables if you like that sort of thing and more stats than you could shake a stick at. There is also a little summary which won't surprise you. Decreasing consumption per capita; this trend started a number of years ago and is expected to continue. Consumers buying less premium brands of beer. Relatively more beer being consumed at home instead of in bars or restaurants, the result being fewer jobs, less value added and lower government revenues being generated by each litre of beer consumed in the EU. Increasing tax burden, especially consumer taxes which have increased in many Member States, and this trend will probably continue for the foreseeable future. Higher taxes on beer lead to higher prices, and reduces beer consumption particularly in the hospitality sector, strengthening the trend for consumption of beer in the home. Once again this is brought to you as a public service.You can read the report here. A small beige room about the size of the Euston Tap, or maybe a smidgen bigger, in a side street near busy Leeds Station and just off the main drag, Friends of Ham doesn't look like a bar from the outside. Despite knowing the area fairly well, I nearly walked past it. It is one o'clock and the place is empty. Well it is upstairs where the bar is. I understand there is more downstairs, but I didn't visit as I 'd have felt a tad conspicuous in doing so. The place is a vista (OK - a small vista) of shades of beige. Beige floor, beige walls, beige bar and stools and light brown rolls of hanging paper which act as wine lists and menus. It would be quite at home in Stockholm or Oslo, but counter intuitively, it works, though a splash of colour here and there wouldn't go amiss. I am greeted cheerily by the inevitable neatly bearded barman and scan the pumps. It is my first drink of this sunny Saturday and I order Roosters Leghorn. I look round and when my gaze returns to the bar, perplexingly I am confronted by a dimpled pint mug full of beer. I remark that I would have asked for a straight glass had I known, but I demur when offered an exchange, remarking that I'll just have it in the old fashioned glass. A jaw drops in this achingly trendy little bar. Have I committed a cardinal sin of implying untrendiness? I hastily offer the explanation that I remember these the first time round, but he doesn't look convinced. Is he unaware that there was a first time, or, more likely, should I clearly know that this is a retro touch? This pointlessly worries me as I retreat to the most uncomfortable stool ever; it is a tiny rectangle of sharp corners that bit into my well padded arse, but they look good. Style over substance, but in there I have to say they are perfect. Young women in matching aprons fuss about filling the tiniest saucers ever with a precarious (small) heap of olives for £1.60 a pop and bringing "sharing bottles" to the stand up fridge. The choice of beer is thoughtful and wide ranging. The bottle fridge is interesting, diverse and representative. Is there a price list somewhere? I don't know. The craft keg offer is well thought out, seems par for the course pricewise and is offered in thirds, halves and two thirds. Three handpumps offer a balanced range. My Roosters is good. Very good, so I order another half. A young couple come in, order beer and disappear downstairs. I would love a look there but somehow don't do it, though I know this is the part of the bar that gets a lot of plaudits. I am missing out here, but drink up and go and am given a cheery goodbye. So what do I think? I really need to visit again, preferably with my lass to tell you. It isn't a place to go on your own, if like me you like to watch what is going on at the bar. In fact it probably isn't a place to go on your own at all. I have no reservations whatever on service which is helpful and friendly, beer choice which is pretty near perfect, or popularity, but I can tell I am not the target audience. It is for trendy 25 to 35 years olds and no worse for that. Friends of Ham know who it is aiming at and judging by the on-line reviews, it does it very well indeed, but somehow I am guessing that there would be few occasions when it would be my first choice. That is probably how it should be. They have a niche that works for them and that is a very good thing. I am guessing too, that it would be very uncomfortable when busy. But younger folks like that and busy is always good for a pub or bar. You may have noticed I am getting spammed a lot at the moment. It all seems to be from the same area and so, reluctantly, I am going to put some word verification on for a short time until this attack passes. I am against this and it would not be needed if Blogger would just allow you to block anonymous comments. It is a bloody nuisance for commentators to decipher the stuff to allow comments, as I have just found out on RedNev's blog where it took three goes before I got it right. So Folks, sorry, but it will only be for a short time. When I worked in Liverpool, Newforge Foods beside our office made Spam. They don't now. Seems they have gone bust. I like to see a good professional at work, particularly when it comes to service in a pub. We all know how bad it can be and indeed, usually is, but sometimes, just now and then, you come across a performance that makes you think "That's how it should be." 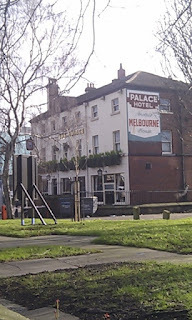 On Saturday, after a quick and first visit to Friends of Ham in Leeds, I went to my old haunt the Palace, where I was being picked up by my better half. The Palace used to be my usual Leeds drinking den when I worked there and you can see from its large windows, Quarry House where I slaved away. It is a Nicolson's pub now, but in my time it started off as plain old Tetley's before becoming a Festival Ale House and then something under whatever the forerunner of M&B was. It has always been a good place to drink, with its large picture windows, dark wood and various nooks and crannies. It has always too had a good selection of beers and I can (not very well) remember among many other boozy visits, delicious encounters with Ind Coope Burton Ale. It is still a fine place to drink in now. When I called about one o'clock, it was quite busy, but I was able to stand in my favourite spot, just where there is a kink in the bar making almost a little alcove. The lone barmaid was serving at the other end of the bar and looked round. "I'll be with you in a second Sweetheart" quoth she. Brilliant stuff, and an immediate big tick from me. A moment later she was over, smiling and taking my order. I watched fascinated as she ran the bar like a true professional. Everyone was given a greeting, a word here and a smile there and advised their place in the "queue". She served two at once, flew up and down and controlled it with a skill that seemed natural to her. She was on her own for a good twenty minutes, yet no-one waited long, everyone was put at ease and thus the ship sailed along in happy harmony. When it got a little quieter, I asked her what her name was and complimented here on her performance. It is Melissa for the record. Running the show like that isn't easy, but boy did she handle it well. It reminds me that every job is what you make it and she made it look simple, which it actually is. A great barmaid in the old school sense and I was taught by the best, so trust me on this one. I was also treated to a virtuoso performance in how to keep four seats to yourself in a busy pub, but that's for another day. Every year CAMRA announces their Pub of the Year after a long process of judging. First of all the CAMRA Branch selects its pub, then the CAMRA Region and finally, the winner is chosen from all the regional winners. It is the supreme accolade for a pub in the UK. 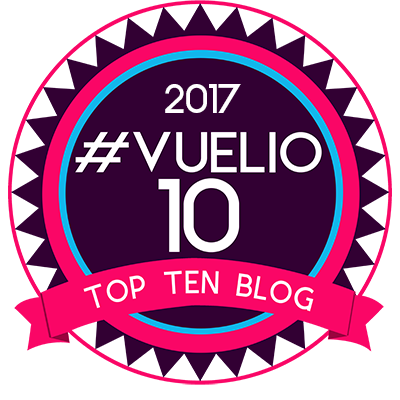 As I write this the result is embargoed until a minute past midnight, but through the wonders of blogger, this post will be legally published just a minute afterwards. Can you tell what it is yet? 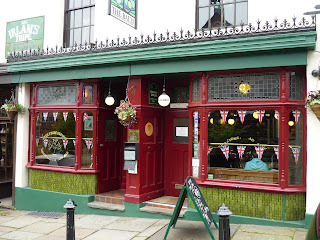 You may have heard me bang on about the Baum in Rochdale, both on this blog and on twitter. It is in my CAMRA Branch area and is our Pub of the Year and the Greater Manchester Pub of the Year and now, it is the National Pub of the Year. I am delighted. More soon, as there is a formal presentation tomorrow, but I wanted you, Dear Readers, to be among the first to know. The Baum, Rochdale, Lancashire has been crowned the best pub in Britain by CAMRA, the Campaign for Real Ale. CAMRA’s National Pub of the Year competition recognises all the criteria that make a great pub, including atmosphere, decor, welcome, service, value for money, customer mix, but most importantly, the quality of the beer. The building, which sits next door to the Pioneers Museum, which is the original Co-op store, has only been a pub for around 30 years and was converted from Morris’s Hardware Store in the 1980’s. Simon Crompton, one of the owners, started work in The Baum in 1993 and became manager in 1994. In 2005, Simon and his wife Heidi, who co-owns the business, bought the pub just two days after having their first child. Peter Alexander, Chairman of Rochdale, Oldham and Bury CAMRA said, "Clearly we are absolutely thrilled that the Baum has been chosen as CAMRA's National Pub Of The Year. While we locally know how good a pub the Baum is, it is fantastic to have this confirmed by senior judges who have never visited it before. Given that the Baum was up against some tremendously fierce competition, Simon and Heidi have done a tremendous job. There is no higher accolade in pub awards and we in the local CAMRA branch are very proud to have Britain's best pub in our area. " I don't know who the last guy is, but he seems to know what's what! I took the photo too! After singing the praises of dark weaker beers in this post a couple of days ago, imagine my surprise to be thrilled silly by yet another 3.5% beer, in the same place, in splendid condition and this time pale and clear. I mentioned my circle of trust in that piece and one brewery that is firmly within is Saltaire. 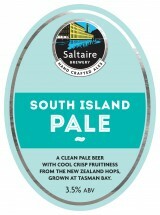 The beer that caught your Hero's attention was Saltaire South Island Pale, a delightful little number with all the tropical flavours you'd expect from New Zealand hops and no trace of wateriness whatever. Saltaire's website shows the fantastic range of beers brewed and they rarely disappoint. Unfortunately the website is remarkably uninformative about what actual hops are used on this occasion, so a point off for that, but it displayed the usual mango, lychee and soft, easy citrus that you'd expect from NZ hops. It gives my old favourite Windermere Pale a run for its money - and in my book, you can't say fairer than that. That said, into each life a little rain must fall. Heading back to the bus station, we called into the Regal Moon. I had only time for one pint and wanted a contrast to the excellent pale beer above. I had enjoyed Old Moor Porter earlier for its earthy complexity and for a change, despite the inner Tandleman saying "This will be a mistake", I ordered a pint of Butcombe Porter. Now I have always thought Butcombe as the kind of beer that to this writer at least, is dull as ditch-water. It was. The porter showed no character or prominent flavours whatever. A typical Butcombe beer in other words. I should have listened to myself. I always talk sense. In case you haven't got the message, Butcombe are NOT in my circle of trust, but my mate Derek thought it OK. If you are worried about the future of pubs, you ought to read this article from the Morning Advertiser. It illustrates clearly how bad the Pub Companies* have been and are for British Pubs. At least you won't have to pay income tax if you run one. You won't earn enough. *I mean here (mostly) Punch and Enterprise. The British Brewing and Pub Association gets a spanking too. The latest figures from the German Federal Statistics Office show that beer production in Germany declined by 2% last year to 96.5 million hectolitres, the lowest since 1990. Perhaps surprisingly, the largest amount of beer was produced not in Bavaria, but in North Rhine-Westphalia, the most populous part of the country. Possibly the most gloomy part of it all is the rise of pre-mix beers drinks such as beer with cola, or fruit juice, which accounted for 4.5% of all beer sales. Readers of the Local put this down to increasing health conciousness and the rise and rise of wine. Though you might think the two are mutually exclusive, it appears the Germans do not. A few correspondents remarked that German beer has lagged behind the rest of the world in innovation. 16% of Germany's beer production was exported though. Sadly too for the Tysons of the German beer world, the previous habit of a beer with breakfast is dying out too as habits change. A rather worrying aspect of all this is that the fall shows no sign of arresting and with few straws to clutch at, people are openly (but given that there are still over 1300 breweries, a tad prematurely) referring to "Brauereisterben,” a term meaning the death of German brewing. There is a rather excellent summary of the ills visiting the German brewing industry here. The gratuitous photo of drinkers in dirndls is just that. Gratuitous. On Saturday we had our Good Beer Guide Selection Meeting at the Greater Manchester Pub of the Year, the Baum in Rochdale. As usual there was an excellent selection of beer and while I enjoyed my first pint of Single Hop Saaz from Marstons, my attention was drawn to a beer I had somehow overlooked. My colleague declared it "excellent" and indeed it was. Dark Star is a brewery I certainly include in my circle of trust. 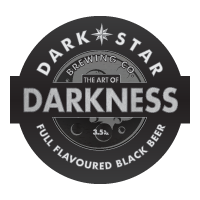 Darkness, is a black as the Devil's waistcoat and served in the peak of condition, at the correct temperature, with a tight creamy head as God intended, it had a wonderful, coal dust, roast barley and dark berry fruit flavour, all overlaid with pronounced resinous hops. (Warrior I understand.) At 3.5% it was a beer you could drink with relish and abandon while still being sober enough to control 30 or so unruly CAMRA members, all vying to have their beer favourites selected. Now with one or two exceptions - the most notable being Windermere Pale from Hawkshead - pale beers struggle to avoid wateriness, when 'down' at this gravity, but in my experience, dark beers, when you put enough of the correct ingredients in them, suffer much less. Dark beers are notorious for hiding brewing faults, especially when laden with alcohol, but I'd submit that at this strength, the skill of the brewer comes to the fore and if there is a better example, I'd like to see it. Well done Dark Star. So Brewers? Want to make a really good beer at a low gravity? I'd humbly suggest that you get the dark malts out. Yes I know Dark Star don't recommend sparklers, but in this case at least, they are wrong. There was a lot of fuss among the geekerati about IndyManBeerCon. Most remarked how wonderful it was and indeed I wrote about it rather positively here. I was caused to think back about it, when struck by a letter in the most recent What's Brewing about how CAMRA shouldn't worry about attracting young people, something I think IndyManBeerCon actively did do, as they'll come to us in time. Set against this background, the very recent final National Winter Ales Festival to be held in Manchester, allowed me, as Deputy Organiser, to spend rather a lot of time in our little podium in the middle (it was a bingo caller's box don't you know) examining the crowd. Not only was that part of my job, but it was instructive to see how the crowd varied and what the mix and dynamics were. I also was responsible for the door and spent every day watching the crowds as they came in. On Thursday, when it was free to CAMRA members, there were vast numbers of over fifties, presumably retired and a sprinkling of younger people. There was also a fair number of tickers in, grabbing the best position and setting out their pre-prepared lists. Later, after work, the crowd while remaining mainly older, was leavened by a healthy sprinkling of younger people. Friday repeated the pattern, though by after work time, the balance had swung more in favour of the under thirties, but maintained a healthy mix. Saturday was more of the same, with a few families in their designated area and a solid mix of ages. Now why am I saying all this? Going back to IndyManBeerCon, there, on the Friday at least, it was mainly and I mean almost totally, those under forty. I doubt if their targeted audience was as broadly based as ours and why should it be? Their customers were much more seriously geeky - and I don't mean that as an insult - much more socially aware and probably, far more affluent. They had a different offer which worked for them. Just as craft keg is a different offer that works for some. Returning to that letter in What's Brewing. The young will eventually become older, the trendy will want to be warm and comfortable, they'll get married and have children. They and their beer tastes will change and develop. I'm getting increasingly relaxed about craft keg. Real Ale isn't going away - there are enough of us around determined on that point - and choice is always good. Come when you are ready Folks. As an aside, these old codgers don't half have a laugh. Plenty of laughter throughout was the order of the day. I don't recall so much of that at IndyManBeerCon. Geeky people don't do laughing it seems.